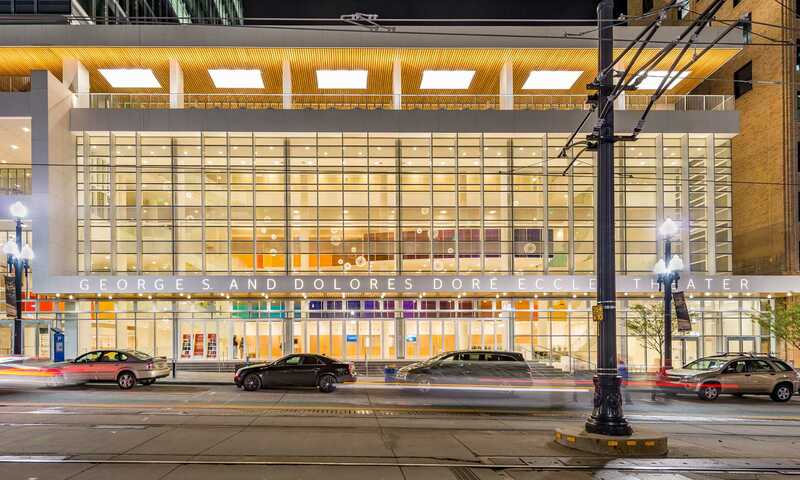 The George S. and Dolores Dore Eccles Theater and the entire Salt Lake City Arts District are buzzing with electricity — but not the kind coming from the power grid. During its first two seasons and one full operational year, the Eccles Theater has spurred economic development of an entire city block and more than doubled the targeted season ticket subscriptions and revenue projections, raking in more than $2.6 million. 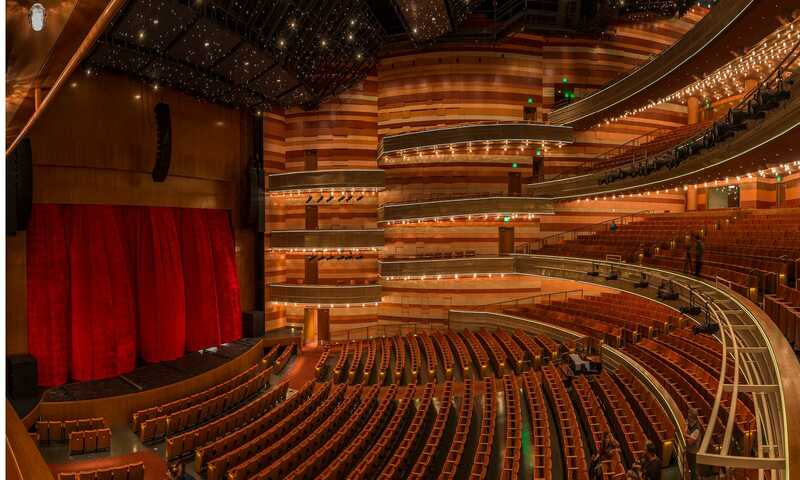 According to the Eccles Theater Annual Report, in 2017 the venue used just 30 percent of its budgeted utilities costs and exceeded the predicted energy cost savings while welcoming more than 350,000 visitors to 533 performances. Since the 1960s, the Salt Lake Chamber and the city’s community leaders had envisioned a Broadway-style performing arts center with the goal to revitalize downtown, increase the quality of performing arts, and boost the image of Salt Lake City. In 2008, the decades’ long dream became reality when the Salt Lake City Redevelopment Agency acquired the theater site, which extended over several parcels and included abandoned buildings. This set the stage to breathe new life and potential into Main Street’s historic district. Project stakeholders established ambitious objectives that would extend beyond the performing arts venue as a new landmark of the Downtown Arts District and a cultural destination for the region: the project was envisioned as an economic catalyst for Utah’s capital city, designed to enrich and infuse the cultural context by attracting first-run touring Broadway shows. Previously, theater enthusiasts would wait years to see Broadways’ most popular hits come to Salt Lake City. The new performing arts venue would reinvigorate the entire arts community by drawing big shows and new audiences to the renewed cultural hub. Reflecting Salt Lake City’s commitment to sustainability and energy self-sufficiency by 2032, project stakeholders mandated a venue that would support great performances onstage while performing at an optimal energy efficiency level as well. The project’s co-creators — HKS, Pelli Clark Pelli Architects, BuroHappold Engineering, along with the rest of the design team — were charged with designing a high-performance venue with low energy consumption. In turn, that could be offset in the future by renewable, city-based energy sources to become the first energy self-sufficient theater in the country. Eccles’ ambitious project goals called for a multidisciplinary, performance-based design approach that would engrain the sustainability and performance goals deeply into the design without affecting the project’s moderate budget and aggressive schedule. HKS and BuroHappold facilitated an eco-charrette with all project stakeholders before the design process started, discussing and clarifying sustainability goals and certifications, viable sustainability strategies and a path to reach net-zero with buy-in from project stakeholders. The project’s sustainability goals and aspirations were baked into a set of guidelines that became the design’s driving foundation, with the primary goal to minimize energy use, and eventually offset consumption through renewable energy, per the city’s proactive greenhouse gas reduction commitments. The building energy demand would be reduced through innovative, integrative and cost-conscious passive and active sustainable design strategies. 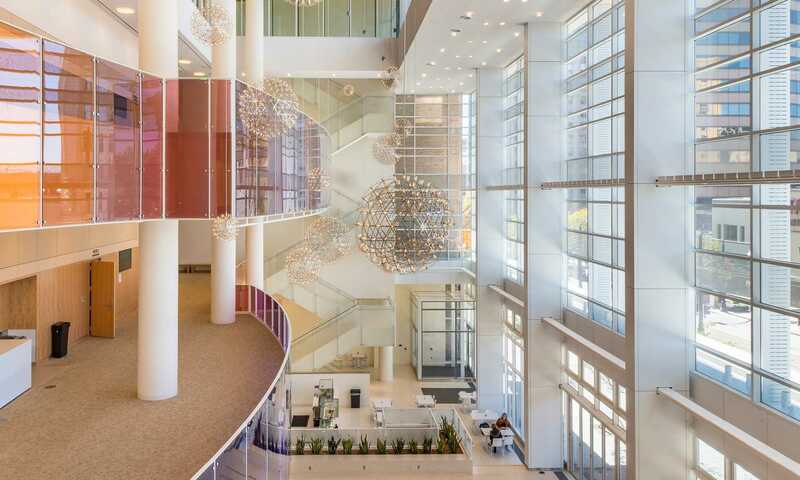 And while Salt Lake City requires a minimum of USGBC LEED Silver certification for new construction, the project team committed to strive for LEED Gold. After the design team analyzed the most viable sustainable strategies, each strategy was tested relative to its efficiency and life cycle cost, using whole building energy modeling in the concept and schematic design phases, which proved to be key to the project’s success. BuroHappold provided energy modeling updates at each major design milestone and value engineering session, allowing the design team to monitor sustainability goals while project stakeholders made informed decisions based on their long-term implications. The architectural team focused on solar heat gain reduction and building envelope performance to reduce the energy demand required to achieve thermal comfort for theater patrons. The reduced window-to-wall ratio, combined with high-performing glass and roof insulation, contributed significantly to the venue’s energy reduction as well as the mechanical systems size requirements. The gradient ceramic frit—a method of silk screening patterns on glass to reduce solar heat gain and glare while adding an artistic esthetic—was used on the west façade as a design element while improving the energy performance of the glass curtain wall. To further reduce energy consumption, instead of selecting one mechanical system for the entire building, the design team scrutinized a variety of mechanical systems for use in different performance and event spaces throughout the theater, according to their volume and use. BuroHappold conducted an analysis of the large main performance hall to ensure it would maintain thermal comfort while minimizing energy consumption. As a result, the main hall takes advantage of its large volume by allowing hot air to rise and stratify while cooling the audience zones through an underfloor air distribution system located below the seats. The winter garden space took advantage of its large floor area through a radiant heating and cooling system which conditions the area hydronically and reduces the demand for conditioning and delivery of air. The result is a high performing venue that reduces energy consumption by more than 30 percent—and now with one full year of operation in the books, Eccles’ utility bills demonstrate the project is outperforming its projected energy savings. In its push to meet the city’s transition to renewable energy, Eccles has purchased enough green power credits from off-site renewable sources to offset 70 percent of the building’s annual electrical consumption for two years. Eccles’ co-creators and operators hope to further optimize the energy efficiency and building systems through ongoing commissioning, monitoring and cost-conscious operations that will bring the theater closer to its ultimate goal of becoming the first zero-net theater in the nation. Emir brings 17 years of experience in internationally and nationally notable healthcare, hospitality, assembly and entertainment projects. His hospitality experience ranges from the MGM CityCenter that changed the paradigm of hospitality design in Las Vegas, to Deer Valley Montage, a luxury ski resort in the Wasatch Range. With over 43 years of professional experience, Mike serves as office director for the HKS Salt Lake City office. He has specialized in both project management and construction contract administration for a variety of construction types.